Earlier this week, Barrons made some headlines projecting that the Dow Jones would hit 15,000 by the end of next year. 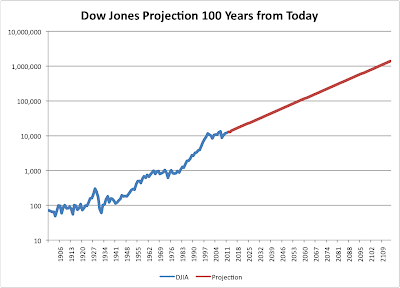 It’s a bold call to be sure, but is it as bold as predicting that the Dow will hit 1,000,000 by 2107? If you compound the Dow ex-dividends at the historical rate of 4.7% then the math says that we should hit 1,000,000 sometime around then. By then, the financial crisis and tech bubble would look like just a blip on the long term chart.